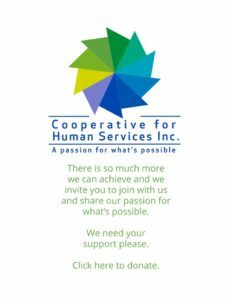 Incorporated in 1981, Cooperative for Human Services, Inc. is a private, non-profit, human services organization devoted to providing programs and services to individuals with special needs and their family members. We provide residential, day, family support and individual support services in over 40 eastern Massachusetts communities, as well as, corporate guardianship services throughout Massachusetts. Our team of 300 dedicated and committed staff and clinicians focuses on partnering with each person served and his or her family to design and create services and supports that foster personal growth, self-actualization and inclusion in the community. We serve nearly 200 individuals in 35 staffed residential homes and 50 independent living apartments and provide guardianship services for another 100 individuals. Our services are designed for adolescents, adults and elders with intellectual, developmental, psychiatric, acquired brain injury and physical disabilities, including people with multiple disabilities such as complex health, medical and behavioral needs. We fully and personally engage with every person/family served making a lifetime commitment meeting each person’s changing needs.